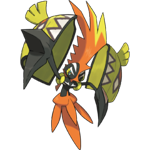 Tapu Koko is the seven-hundred-and-eighty-fifth Pokemon on the National Pokedex and was introduced in Generation 7 (Sun & Moon). Tapu Koko is a Electric/Fairy type Pokemon. It is a Basic Pokemon that does not evolve. Tapu Koko is a legendary Pokemon and one of four Island Guardians of the Alola Region.